When you were little, you may have done just about anything to lose a tooth and get a quarter from the tooth fairy— including tying a string to a doorknob. However, now that you’re an adult, the idea of having your teeth pulled may sound more like a nightmare than a quick way to earn some money. Just remember that your imagination is far worse than the actual procedure. With the expertise of Dr. David Sorenson at Blue Water Dental of St. Johns, you can get your tooth pulled and got on your way before you know it. To ensure that you don’t get an oral infection and that you recover quickly, use these tips! After having your tooth pulled, nothing will feel quite as soothing as gently rinsing with some warm salt water. Simply take some warm tap water and mix about ½ tsp of salt into the cup. Once you have created the mixture, rinse your mouth out with it until you start to feel some relief. Depending on the extraction site, you should be careful of what foods you eat. For instance, eating notoriously hard-to-chew foods like steak or apples may be out of the question until you get your tooth replacement. 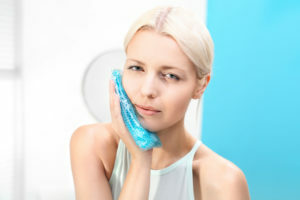 Vanilla Ice was onto something when he wrapped, “Ice, Ice Baby.” If you have some inflammation around your jawline or cheeks, take a soft, gel ice pack and apply it directly to your face for about ten minutes at a time— this will help ease the pain and alleviate the swelling. And, if you want to make it better, crank that Vanilla Ice while icing. We encourage most patients to take an over-the-counter anti-inflammatory medication for the first day or two after the extraction to help make them feel more comfortable. To learn more about tooth extractions or to schedule an appointment, contact our Point Vedra office today!